As of writing this there are only 2 days left in 2016. It’s been quite a ride hasn’t it? Lots of people are REALLY ready to feel those fresh start feelings with 2017 beginning so soon. I love that. A new year, new start and all those yummy things! One thing I would like to share with you is this…you can get all the fresh starts, clean slates and new beginnings you want, but they are often quite pointless. Why? It’s simply really. We have a tendency to drag all the old crap with us. We need to learn and practice letting it go. There is an old saying that life can be like the monkey bars in a child’s playground. In order to move forward, you need to let go first. If you can’t let go, you will remain stuck right where you are – legs dangling everywhere! And dear ones, ‘stuck’ is only helpful in arts and crafts and stamps! It’s not one of the easier lessons and may even involve some tears (and that’s okay) but letting go is absolutely necessary in order to build a life that you love living and that is full of meaning and joy. 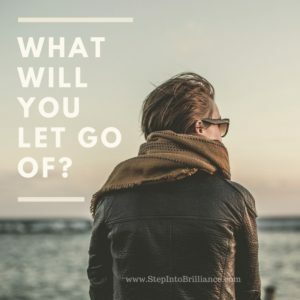 Just like most things, it’s important to be quite intentional and purposeful about doing this letting go business. It won’t really be helpful to think about it once (maybe only as long as it takes to read this post) and then forget about it. Action must be taken. In fact, many people find a specific ritual, or practice can be quite helpful to the letting go. This can be quite personal and as elaborate or simple as you prefer. Right from simply adding to a list, to participating in cord-cutting ceremonies, to creating intentions with prayer, or burning a list of things to let go of and ceremonially sending that list back to Source. Whatever helps you solidify the intention and create a moment of feeling that you have let go. For most folks I find that writing down a list of what you want to let go of can be a terrific jumping off point. There is really something quite magical about putting a pen to paper and allowing your inner thoughts to come to light. I challenge all my groups to do this before midnight on Jan 31st, and I’m challenging you too! What do you need to let go of to really feel lighter and open in 2017 to all possibilities? There are so many possibilities! I suggest you sit with the question quietly and listen to your own inner wisdom. There is no right or wrong answer of course; it’s about you, and what you need right now. However, if you’re feeling a bit lost here are some things that have come up in my groups. These are just a few ideas, most likely yours will be far more specific; or maybe they won’t. Just let it flow from your heart space and know it will always lead you to where you need to be. Writing them down helps you commit to them. Let me know in the comments below or over on my Facebook page, what YOU will be committed to letting stay in 2016 so you have the space in your life to create things that you want in 2017. Big love and many blessing in the coming New Year!